Initiation is a peculiar animal. You can spend your entire life studying for it, praying for it, prostrating yourself before the gods for it, and never get it. While you probably won’t see it that way, the gods are probably sparing you by not giving you your wish. On the other hand, you could be meditating on top of a pyramid, minding your own business, and zap you’re initiated! You now have this newfound knowledge, symbols marked on your aura, and you’re charged with the responsibility of figuring out what to do with this energy influx and who else to give that extra energy to. Whether that’s a blessing depends on you. To get what you can out of the book Sekem Heka, you will have to understand how initiation does and doesn’t work. You have to know that initiatory levels are far more than systems of study, and that it isn’t knowledge-based worthiness but readiness on a karmic level far beyond human conception and certainly beyond your own that determines ascendancy through levels of esoteric knowledge. To benefit from this book, you have to do as reiki healers do: set aside judgment, especially judgment of yourself. While the book is organized according to different initiatory levels, you are not restricted from use by initiation. You can do the exercises at any point in your personal practice but you will have to understand that exercises alone, decision alone, sheer force of will can not confer the symbols to your aura that Sekem Heka represents. Sekem Heka is an integration between reiki and a revealed healing system discovered by Patrick Zeigler. Sekem Heka walks through the integrated healing systems of Zeigler’s seichem, reiki and the Hindu chakra system. The book offers a series of hieroglyphic symbols and Egyptian gods, followed by a series of meditative exercises to guide the prospective healer through the Sekem Heka system without conferring or implying the conferral of initiation. The system is clearly based on modern practice, and the understanding of the Egyptian gods is clear and accurate. This is a quality book with a well-thought out training system designed by a person who clearly used the exercises described. The questions raised by this book are evolutionary and social in nature; the inquiries are based on the mentality that led to the need for this book and in no way any shortcoming of the author. The question raised is this: why and how is reiki obscuring other healing systems throughout other cultures? Part of the need that motivated the writing of Sekem Heka was for an Egyptian-related healing system. Ancient Egypt did have a healing system, grounded in a combination of medical knowledge and folk magic. It is unclear why the scraps of folk magic left behind were left untested in favor of reiki, unless perhaps the author tried them and did not find them useful. 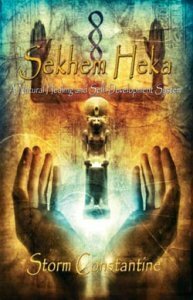 If you are pursuing reiki and you are either an Egyptian devotee or a person looking for ways to adapt reiki into your own cultural tradition, Sekem Heka is an excellent and ground breaking example. Definitely take it into consideration as a possible model for working out your own traditions and integrating it with eastern healing. Ultimately initiation into any system is divinely conferred, but this gives you one method for acquainting yourself with the necessary divinity.